UNRELENTING pressure from environmentalists in Udaipur finally seems to have forced the Rajasthan government's environment department to take action to stop the pollution of the city's lakes. After years of protests, in August, the state environment department sent off notices to 10 hotels located around the Pichhola, Fateh Sagar and Swarup Sagar lakes, asking the authorities to stop discharging untreated effluents into the lakes within two months, failing which "more stringent" action would be taken against them. The notice has, however, failed to satisfy the environmentalists. As Rajiv Khandelwal of the Ubeshwar Vikas Mandal put it: "These (the hoteliers) are just a few of the offenders. The department must take prompt action against the other culprits. It must also stop the construction of a luxury resort near the Jaisamand lake." The primary reason for the neglect of Udaipur's lakes, nevertheless, seems to be that "they are nobody's baby", as former Udaipur collector Rakesh Srivastava put it. 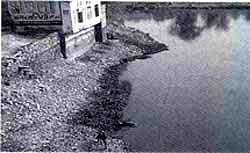 The lakes are the property of the state revenue department, they are to be maintained by the water resources department, the water is to be utilised by the public health engineering department and the municipalities, while the pollution is to be monitored by the environment department. Small wonder then that they are mere spectators to the degradation of the water bodies.